Eighteen months ago, in the monochrome sunlight of a January afternoon, someone close to me was involved in a road traffic accident. He sustained two obvious injuries: a cracked bone in his wrist and a whack on the back of the head a smile's width from his right ear. He has no memory of the accident, no memory indeed of the next four days in hospital. The cold air of the car park on the final day is all he feels now. And that is the problem, if there is one. There is no clear object of this wondering. In order, perhaps, to write differently. So what would it mean to write as one imagines writing rather than in this hesitant, potholed manner? As I waited in a hospital bed, I imagined this other life of writing in which the word disappears. Little has changed. I have written before about those nine days, how listening to a documentary on the pharaoh Akhenaten caused an obscure epiphany which later I assumed was due to the morphine. However, recent events have challenged that assumption. Akhenaten had ordered that the capital city be moved from Thebes into the desert 200 miles away. The documentary featured new archaeological discoveries that revealed the disastrous consequences for his subjects. What stirred me was not these human facts but the glorious and terrifying absurdity of Akhenaten's project. It demonstrates the same impressive or horrendous folly as those in fictional works: William Golding's The Spire for example, and Herzog's Fitzcarraldo and, more familiar to me, those of the many characters created by Bernhard: Roithamer who builds a cone-shaped house in the middle of a forest, Reger who studies every masterpiece in the Kunsthistoriches Museum in Vienna until he finds a flaw in each, even Bernhard himself aged eight deciding to cycle to his aunt's house in Salzburg, twenty-two miles away. A creative writer may respond by sketching a novel idea based on the crazy plans of an individual - perhaps Naguib Mahfouz's Akhenaten: Dweller in Truth is it as far as the pharaoh is concerned - but, in my sedated condition, I imagined a writing project that would itself be the absurdity, something itself animated by impossibility. As I noted in that post, nothing specific came of my epiphany. Since then I have wanted to write about the accident and this strange time in hospital but have also felt uncomfortable about discussing an experience that seems hopelessly subjective. The details of the accident were also sub judice. The police were unable to release the witness statements until the case was resolved. I had to wait an indefinite period before I could find out what a buckled rear wheel couldn't tell me. In June this year, out of the blue, the case was concluded and, soon after, I received the statements in the post. This was a reality I had been unable to anticipate. It was unreal. For over a year I had imagined the permutations of what may have happened, but had failed. I couldn't imagine anything. Perhaps one day, I thought, I will experience a flashback to the shock of the impact. But no, nothing beyond the memory of an uncertain point in the road. (If this is what death is like, I thought, then it's fine; it's nothing.). And then I became uncomfortable about the possibility of the reports triggering such memories or, if they did not, then planting indelible images in my head. This would be experience without experience, I thought; history without event. But really, it already is. All I could do was to submit to more. As I opened the envelope and flipped A4 sheets over and over to get through the formal police checklists and onto the handwritten and typed statements, I felt a slight derangement, an almost physical vertigo. This is the fear of reading. This is why I cannot read crime or horror novels; books which bring great suffering into being for no other reason than generic necessity. It is a terrible addition to actuality. Actuality occurs once but literature never ends; every moment in a novel is eternal, every character immortal. Fiction makes something happen forever. This is what stirred me when I heard the story of Akhenaten's new city: the real presence of the imagination. So I submitted and looked at the witness statements. One saw the cyclist fly into the air still holding the handlebars, then land to lie stock-still across the tarmac. The other witness got out of his car and ran over. After a minute or so the cyclist opened his eyes, sat up straight but did not respond to questions. Blood ran out of his right ear. Then he insisted on moving to the side of the road. That was it really. I read the words with a forensic attention, as if each was an unrequited love letter, yet what I really wanted wasn't there. I wanted to see what was not seen. Why was the fracture below the overhang of the skull? If my head struck the tarmac (there is no curb), how was this part damaged rather than the crown? Perhaps it hit the frame of the car, but wouldn't that have been more damaging at such speed? Reading the statements has not been enough; answers have become questions. What remains? The legacy of traumatic brain injury for one. My inner ear was damaged so I have had to retrain my sense of balance (this also has a weird side effect that mimics chronic fatigue syndrome). I may be able to cycle again as a result and so regain the freedom I lost. My sense of smell has gone and may never return - this also diminishes the sense of taste - while concentration and short-term memory levels are lower. On the plus side, I think my writing has improved; that is, has become more closely attuned to what concerns me and renews the fascination with books with which I began twenty-four years ago. This beginning and the time in hospital tell me that, while reading and writing are not enough, life isn't, either. There is undoubtable pleasure in beginning to read the story of another's life. Whether it is in a novel or in the more formal context of a biography, we enjoy both the tremor of an imminent adventure and a profound sense of security. No matter what befalls the characters or the subject, however unfortunate they are, however cruel, brave, silly or dull, we are enveloped in the silence of a book, luxuriating in its unique serenity. After all, we know what is happening because we know what will happen in the end. Yet, while this peace is pleasurable in the simplest sense, it is also haunted. This is what makes it unique. In reading stories we reconcile contradictory forces. As Sartre pointed out in Nausea, when we read a novel, we identify with the protagonist because we too face an imminent adventure, only, in the case of the novel, it has already occurred. It wouldn't be a novel otherwise. In reading of another's life then, our own becomes a narrative and afforded the same comfort of meaning given to a book by its necessary enclosure. Meaning is given by the end of possibility just as a mirror is afforded meaning by its dark backing. So, in one place, we have both the sense of infinity and its signifying limit. A novel is therefore pleasurable for only as long as it can maintain this reconciliation, hence the lingering disappointment at reaching the final page and the relief of beginning again. However, the haunting extends beyond the book. Away from the page, never convinced by stories for long enough, we still wonder what meaning our lives may have. While many turn with relief to the invisible books of religion, science or politics in which meaning illuminates every distant corner, writers of fiction and their publishers pursue the reconciliation with a confidence guaranteed only by unease; a commercial foreboding of tenebrous insignificance. Some writers exhibit the unease more openly by examining the space between art and its creators. The really important things in any biography are what someone thinks and feels and not what he has done. In recent years, biographical fiction has become almost a distinct publishing trend. Since the 1990s, there have been several novels in which the lives of real writers and artists - that is, historical figures – are the main subject. Colm Toibin's and David Lodge's novels about Henry James are two prominent examples. There is also JM Coetzee's The Master of Petersburg and Summer in Baden-Baden by Leonid Tsypkin, both of which feature Dostoevsky as a protagonist. Notable others include Gert Hofmann's enigmatically cheerful novel about the aphorist GC Lichtenberg, Penelope Fitzgerald's story of Novalis and Joanna Scott's Arrogance about the painter Egon Schiele. And the latest edition of The Reader contains an extract from ∞ (a.k.a. Infinity), Gabriel Josipovici's novel-in-progress about Giacinto Scelsi, the eccentric Sicilian composer. There are surely many others (which you can tell me about in the comments). If this is a sign of anything, it is that the mystery of the intimacy and distance between life and art has been noticed and is being addressed, even if its expression is misunderstood and misrepresented by the gatekeepers of reconciliation. They assert that writing about writers, art about art is at best an entertaining sideshow, at worst a form of navel-gazing – albeit someone else's navel – an absorption that is also a desertion of the socialising role of art. Each argument is valid if one has a particular understanding of the place of creation. However, if one has another, that art is, for example, a fundamental dream, an enabling illusion, then such demands only reaffirm the distress of harmony and the comforting rupture in the experience of fiction. So do these novels about artists merely seek to erase the distance between author and work, to describe the life from which it emerged and thereby explain both? Is the disenchantment of art all we have left to enjoy? 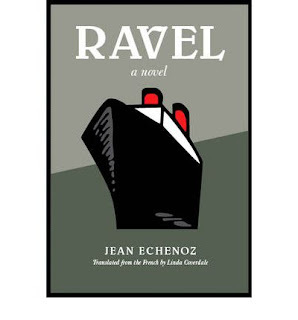 Another recent novel about a composer – Jean Echenoz's Ravel, an exquisite, lighthearted summary of the final ten years in the life of the composer of Boléro – offers a negative answer to both questions. The time constraint in the novel is significant, particularly as it begins separated from time. Whereas In Search of Lost Time begins with Marcel in the timeless space of bed, Ravel opens with the regret of leaving another warm embrace. Yes, better to remain. Leaving the bath is not unlike returning to the world after reading a novel; if we are not uncertain on our feet, we still shudder in the cooler air. But we know that time will not relent and we have to make a journey. It's also significant that this opening does not quite specify who is in the bath. This immediately involves the reader rather than separating him or her from the subject of the novel. We are, as it were, in this bath together. Echenoz follows Ravel as he dries himself and then delays his departure with preparatory rituals. He cleans his teeth, shaves, plucks his eyebrows, pares his fingernails, combs his hair, chooses which clothes to wear – he has an enormous wardrobe – and then goes around the house switching off appliances. The precision and swiftness of description is itself a bath-like pleasure. Time intervenes only when he leaves the house and "icy air suddenly buffets his backswept and still-damp white hair". One word and suddenly we realise Ravel is not young. This is a fine example of Echenoz's gift for inconspicuous concision: "white" here makes the presence of another life felt with an intensity that also passes by as a simple description. No doubt Ravel feels the presence too though we are never told. Not being granted access to Ravel's inner life is also one of the novel's great pleasures. Glenn Gould may be correct except not knowing what someone thinks or feels can also be experienced by the subject of the biography. Assuming what they think and feel through their actions is the important mistake. It then becomes a matter of allowing for what we or the subject himself cannot know to resonate. Echenoz does this by sketching a translucent surface. While Ravel remains "Elegantly aloof, icily polite, not particularly talkative", we realise he may also be aloof from himself, not quite there except in what he can display to the world, particularly in his music. It may be why he is so keen to dress well, to reveal himself as only covering up can do. Before a concert, he mislays some patent-leather shoes and refuses to perform until they are found. Does he know why? By the time the novel opens, Ravel is already world famous for his music. He has left his bath to journey to the harbour to board a transatlantic ship for a tour of the US. He is fêted and fussed over by everyone, though all he seems to be want to do is to lounge in solitude watching the landscape from an observation deck, perhaps to contemplate his next composition. When he is forced to socialise, such as at the Captain's table, Ravel entertains everyone with his tales of driving a military truck near Verdun in 1916. One day, his vehicle broke down and he found himself on his own out in open country, where he spent a week à la Crusoe. Taking advantage of the situation, he transcribed a few songs from the local birds, which, weary of the war, had finally decided to ignore it, to no longer interrupt their trills at the slightest blast or take offense at the constant rumbling of nearby explosions. Ravel is of course much like the birds. Weary of the worldly turmoil, he steps aside to write music. In the midst of a copyright dispute over music for a ballet, Ravel decides on a whim to write something entirely new: "it's only a ballet, no need for form strictly speaking or development, practically no need to modulate either, just some rhythm and the orchestra. The music, this time, is of no great importance. All that's left is to get on with it." Back in Saint-Jean-de-Luz, early in the morning, here he is about to leave for the beach with Samazeuilh. Wearing a golden-yellow bathrobe over a black bathing costume with shoulder straps and coiffed in a scarlet bathing cap, Ravel lingers a moment at the piano, playing a phrase over and over on the keyboard with one finger. Don't you think this theme has something insistent about it? he asks Samazeuilh. And this is how Boléro, his most famous composition, came into existence, at least here. No dramatic revelation as to what personal secret inspired this work – it was only a commission. To those bold enough to ask him what he considers his masterpiece, he shoots back: It's Boléro, what else; unfortunately, there's no music in it. Amusing anecdotes like this - and the novel is delightfully full of them - may give the impression that this novel is a mere confection. We may assume it can now be left to monographs and official biographies to lay the heavy meat on the scales and to win serious acclaim for helping us to understand Ravel in his musical and historical context. But this would be to deny what makes reading Ravel, and indeed listening to Ravel's music, an uncanny experience. After Boléro, Ravel is seriously injured in a traffic accident and retires from public life. A brain injury means he forgets how to perform simple actions such as signing his own name and, more dangerously, how to swim. He is found floating far out to sea. At a concert of his own music, Ravel turns to his neighbour: "That was nice, he says, really nice, remind me again who the composer is. One is not obliged to believe this story." Echenoz's insouciance may be offhand yet here it reverberates with the essential mystery floating this novel. It began in the bath with the absence of time and now ends with the absence of Ravel from himself and his music. People happily talk about the mystery of poetry and of literature. They talk about it ad nauseam. However, nothing is explained, I have to confess, by alluding here to magic or religious ecstasy, wishing stones or observant animals. To talk about the ineffable is to say precisely nothing at all. To talk about secrets is to confess nothing. Poets may indeed be devout, but to what are they devoted? Writers may know a great deal, but what kind of knowledge is it? It is seventy years since Jean Paulhan wrote this, the introductory paragraph The Flowers of Tarbes, his study of literary language, and it seems pretty dated. After all, isn't everything in the process of being explained? Now it is clear they don't talk about the mystery of poetry and of literature ad nauseam. Mystery has been replaced. In the US, according to BookForum, "the enormous novel of technical, scientific, or historical knowledge [has] become the highest credential for male writers". The buzz in bookchat rises when fiction dramatises and enables discussion about current ideas and events, perhaps because this also encourages popular consumption and debate among those for whom fiction is so much play. The situation is due to many contingent factors - such as those outlined in Mark McGurl's The Program Era reviewed above - but the underlying trend suggests a fundamental disconnect with the origins and direction of art. While people still respond to the deep current of literature - why else are we stirred by fiction? - rationalism and commerce has drowned the happy talk. Paulhan goes on to accuse critics of neglecting mystery. But what mystery is there to be found? Summarised crudely, Paulhan examines the place of mystery in literature by outlining the two opposing conceptions of literary language. One – which he calls Terrorist – that is at war with cliché as it seeks to bring the absolute immediacy of actual lived experience to the word, while the other – Rhetoricist – is content to work with conventional language to maintain clarity and order. While the implications go beyond literature, we can summarise its literary aspect with a reminder of the historical opposition of, for example, Joycean stream-of-consciousness and Edwardian fiction. To make it contemporary, we are all familiar with the widespread perplexity over the distinction between literary and genre fiction. Paulhan finds the Terrorist conception wrongheaded. After all, a word is also a sign - its referent's Platonic ideal perhaps - a cliché by necessity. The reader recognises unrefined, authentic language only by failing to remember its ideality. The war on cliché demands an impossible private language. Even when a populist like Nick Hornby complains about "opaquely written" fiction, he isn't claiming it's gibberish. Whatever we write, literature takes possession of it; thus "experimental" writing is as far from the ineffable real as the most formulaic genre piece. Mystery, it turns out, is in the illusion of literature's absence. So how does the individual, uncontent with illusion and compelled to resist silence in order to capture the pressing matter of real thought and real experience, begin to write? Paulhan recommends ceding to cliché and working within its constraints - comparable today perhaps to Daniel Green's championing of literary aesthetics. We can see how this has been embraced in its crudest form in mass market book culture. Here the highest praise for a writer is that she does "a good professional job for the reader". The irony is that in the embrace of constraint, cliché itself becomes an elitist private language, indistinguishable from its sworn enemy. Unless one has been initiated into the true meaning of clichés, they can appear like cryptic clues to the machinations of an arcane world (hence the apocryphal nerdism of genre communities). One has to read very carefully before one can forget one is reading. Genre literature thereby performs a dual function - worldly and mysterious. Given this happy double, it's no surprise that creative writers submit to the constraints of technical, scientific and historical knowledge. It also explains the emergence of autobiography – the so-called misery memoir – as a force in the literary marketplace. Shorn of artifice, the life story purports to be truth in the raw, closer to reality than the contrivances of novels. Of course, as the James Frey Controversy revealed, fiction is not so easily dispensed with. Oprah Winfrey's public admonition of the author is perhaps revealed as less an expression of propriety than one of distress and disbelief in the mysterious, illusory movement of the Book, the form she has otherwise embraced as a means of self-help and social empowerment. On a Monday morning soon after sleep I wrote out a fragment of a dream. Its violence and purity provoked an impulse to record. Why was this apparent non-event so much more vital and haunting than the remote disturbances of consciousness? It's a question such writing asks between night and day. The hope is that violence and purity will emerge in the scribbled commentary; words containing, as Beckett put it, "the integrity of the eyelids coming down before the brain knows of grit in the wind". However, once written, the breeze dies; estrangement from the purity of the dream is indistinguishable from that of the day. Conscious narrative can only reinstate the uncertainty that the dream itself terminated. In writing, experience enters the realm of possibility rather than actuality; only asking remains. This must be why I feel no pressure to write out lived experience nor to reproduce the dream narrative here; that is, no wish to make an object subject to interpretation. Perhaps actuality is the termination of objects. What was written was interpreted. Rather than the written dream revealing a Freudian cliché of unconscious desire, the purity, I realised, was a product of the dream's dramatisation of two or more contradictory impulses and their distillation into one. For this reason, it was an event that it could never play out in actual existence. To make the truth known, it had to be a lived fiction. Conscious existence seems lesser because it cannot maintain itself without contradiction. No wonder there was an urge to record the dream. And while it could be said only the individual who dreamt could appreciate the urgency of the revelation, a dream also means this: the end of individuality. There is an added consequence: dream writing, as a means of responding to the pure work of sleep, thereby becomes a form of literary criticism. However one writes out one's recollection of the dream, it is already a commentary, already an idea of the thing, an act of reception, not the thing itself. The primary event itself resists repetition. Yet the primary event, the pure work, is not the real thing either. The real thing takes its course and we are left to respond in the stillness of midnight. The dream's actuality is the actuality of art; writing upon writing. In response to this post at RSB. A new online literary and arts journal Cerise Press has posted its first issue. The site says it is based in the United States and France and aims to build "cross-cultural bridges by featuring artists and writers in English and translations, with an emphasis on French and Francophone works." Despite that, in this issue you can find translations of poems by the Russians Akhmatova, Mandelshtam and Tsvetaeva as well as those from the French of Apollinaire and Abdelwahab Meddeb. I don't know why I'm bothering to write to you. You're dead, for one thing. All we really share is a love for Glenn Gould and long sentences, probably that's the same love in different forms. Forms of art. I think it's mostly because I want to borrow your complaining tone.